Hanging File organizer features front and back frames that fasten to the drawer box for stability and a versatile T-Rod that creates divided storage for both legal and letter size folders. Fits 18 & 21 base cabinets but can be trimmed to fit a variety of drawer sizes. 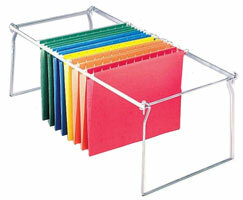 Each Unit Contains: Letter file drawer system with T-Rod divider. Designed for all vertical files (Steelcase, Hon, Global and others). Adjustable length from 18" to 27" long. For 9-1/4" drawers. Adjusts from 24"- 27" deep. To assemble tighten screws where side rails, end supports and crossbars meet. After assembly, insert frame into empty drawer. Designed to fit over a 1/2" standard wood drawer side. 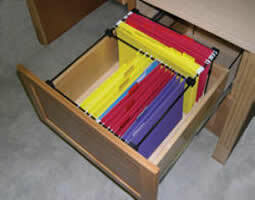 Use with our Plastic Rail Clips and 1/2" or 3/4" file bar stock for combination legal/letter drawer configurations.